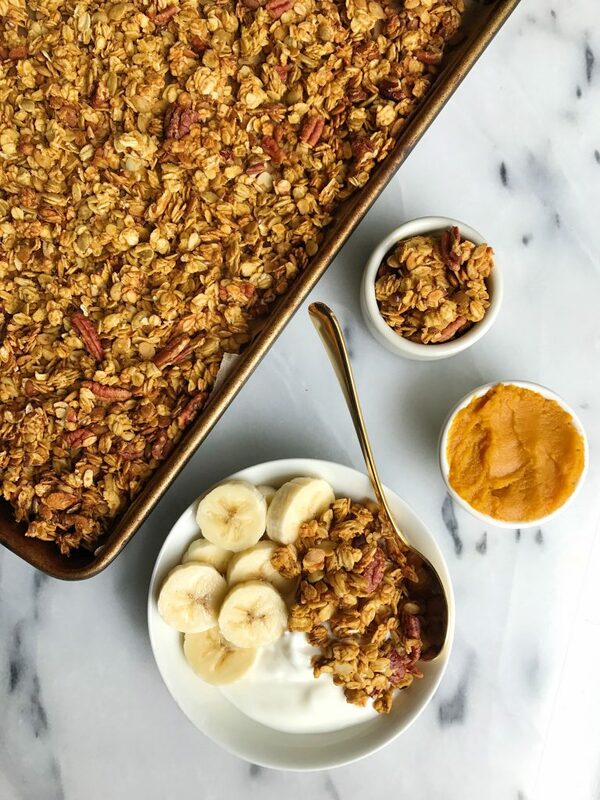 Crunchy Nutty Pumpkin Pie Granola for an easy gluten-free and vegan granola! I am the first to admit that I am not the best homemade granola maker. I have tried a few times and yes they are yummy but for some reason I always like the brands you can get at the store better. They are crunchier and the whole skipping the baking part also isn’t too bad ha! But I am a sucker for my favorite granola recipes here on the blog, especially the chickpea one! 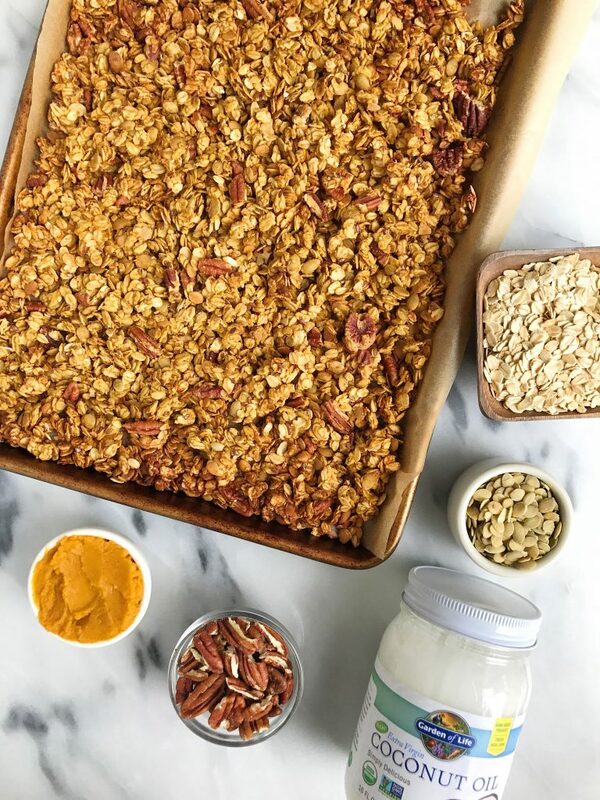 But this Crunchy Nutty Pumpkin Pie Granola is my first official oat-based granola that I actually made and it turned out crunchy and sweet with no refined sugars! Plus I added a few of my favorite fall spices and nuts and seeds to the granola to make it hearty, satisfying and simple! It is mind boggling to me the amount of granolas out there LOADED with excess sugar. I am all about a little sweetness but sometimes the amount added is just silly. I use a couple tablespoons of maple syrup in this whole recipe and it is just the perfect amount of sweetness! Making this granola will take you 5 minutes to prep basically and then only 30 minutes to cook! 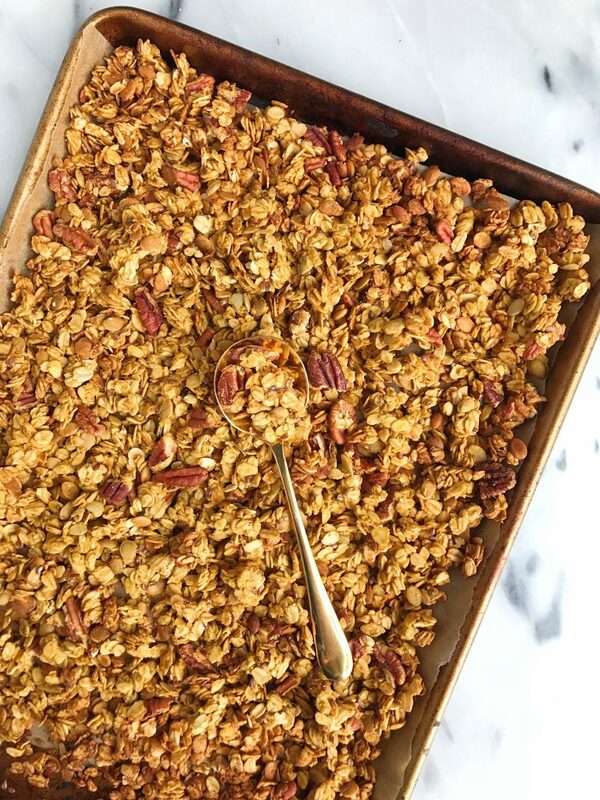 Quick and easy and then you will have a delicious fall-inspired granola to enjoy for days. Store in airtight container on countertop for a week or in the fridge/freezer for longer! This sounds so amazing! What do you suggest for making it grain free? Additional nuts and seeds? Love me some pumpkin! Live in the fall!!! Do you have any nutritional information on this recipe? Thanks in advance!